The Holidays are the most important time of the year for the online retailers, and it's not without a reason: according to a BIGresearch survey, the Internet will influence 30.2 percent of holiday sales this year, up from 28.9 percent last year. Also this year, Cyber Monday, the ceremonial kickoff to the online holiday shopping season, is expected to be more promotional than ever as retailers offer one-day promotions and special offers to bring holiday shoppers online. The stakes are being raised for retailers to provide a consistently positive, more sophisticated experience for the online holiday shoppers. WebSitePulse is monitoring ten of the most popular online shopping destinations for the 2007 Holiday Season. The Reports reflect a typical online purchase transaction, like selecting an item, adding it to the shopping cart and checkout, representative for the End Users' interactions with a website. Measurements of the multi-step transactions are made every 15 minutes, simultaneously from 3 different US cities. The reporting period covers the dates between November 21, 2007 and January 5, 2008. For complete details, please check the Methodology we used for this report. 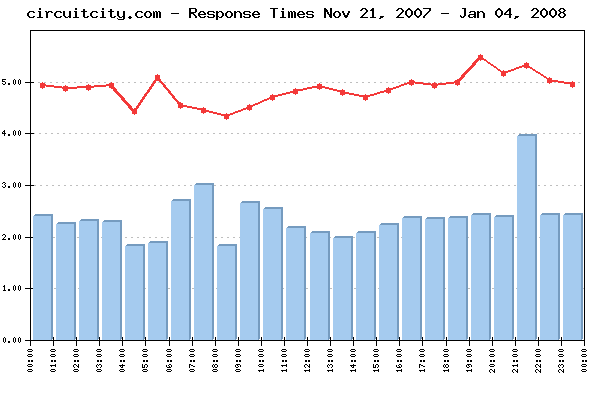 The daily Average Response time from all monitored websites was 4.588 sec. 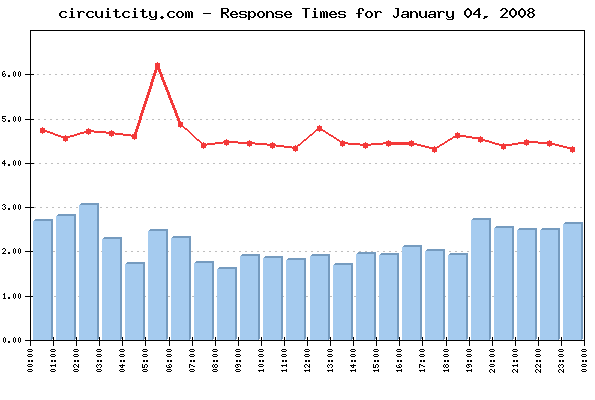 The Average Response time as measured from the US East Coast (Washington, DC) was: 4.060 sec. The Average Response time as measured from the US West Coast (Los Angeles, CA) was: 5.561 sec. 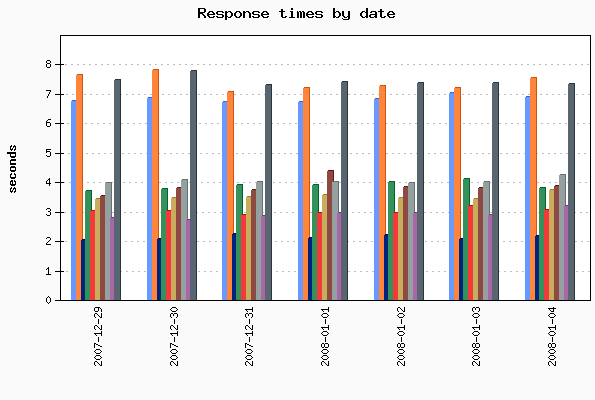 The Average Response time as measured from US Central (Chicago, IL) was: 4.144 sec. The Best Response time measured from the US East Coast was: 2.138 sec. The Best Response time measured from the US West Coast was: 2.385 sec. The Best Response time measured from US Central: 1.984 sec. The typical shopping transaction took the least time for circuitcity.com visitors - 2.189 sec., while the visitors of bestbuy.com had to be the most patient, as the shopping transaction there took in average of 7.546 sec. The daily average uptime for the entire Group was 99.53%. Seven websites' availability was above the average, while three sites dragged the average down with below-the-average availability. No events of particular importance or possible negative impact on the online visitors' interaction with the Websites included into the 2007 Holiday Season report were detected during the reported period, and according to WebSitePulse, the Group delivered the expected levels of End-User experience and Customer satisfaction. The 2007 Holiday Season Reports reflect a complete web transaction, representative for the End Users' interactions with a website. The reporting period covers the dates between November 21, 2007 and January 5, 2008. Performance and availability measurements are made for a typical multi-step web transaction at 15 minute monitoring interval, every day 24/7. The WebSitePulse application monitoring service is used to collect data and to create the reports.